Girlfriends continuing their chat at a red light. The one on the right practices the old school red light posture. Getting right off the bike and waiting for green. Style over speed indeed. Maybe it goes with being a violin player. 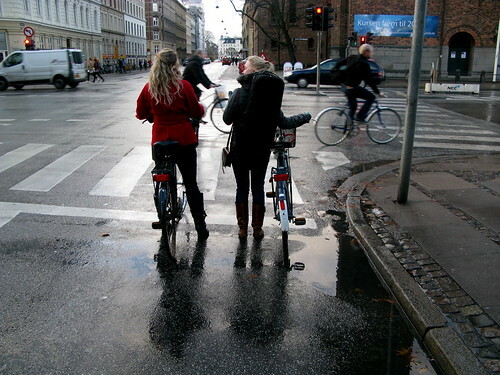 Or just being a Copenhagener. Or both. 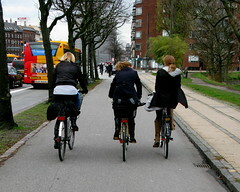 And on some stretches, there's room for three [or more] friends to ride astride and chat on the bike lanes. Nah, not violin player, so it must be a Copenhagener thingie. I love the hats. How about a series on the chic hats of Copenhagen? It's the first thing I look at (and then the architecture). Such a contrast to the helmeted heads in the US, no matter how well-dressed. 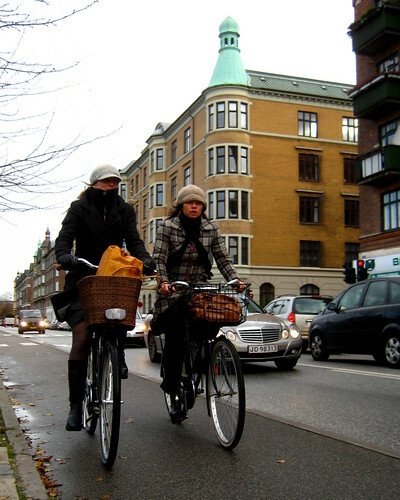 i suscribe lynn, copenhaguen cycle hat chic, good idea! I have never had anyone yell at me "nice helmet", but at least once a week someone shouts out a window, "nice hat" or "nice beret".